Exclusive black-and-white TARDIS Bobble Head bobbles and includes sound! Features a remarkable Doctor Who logo base. Entertainment Earth Comic-Con Exclusive! With this extraordinary TARDIS Bobble Head based on the Classic Series, the entire TARDIS bobbles... and it includes the signature materialize and dematerialize sounds! 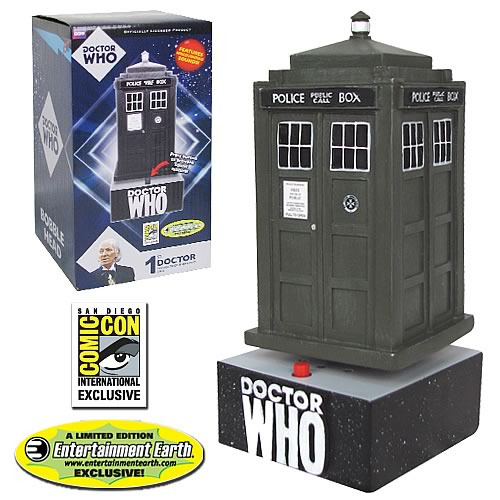 Measuring approximately 6 3/4-inches tall x 2 3/4-inches wide x 2 3/4-inches long in striking grayscale paint, the unique resin bobble head also features a Doctor Who logo base with a button to activate the sound. You simply gotta get one of these! Requires 1x "AG13 (LR44)" battery, included. Limited edition of 1,500 pieces.